As part of an ongoing effort to increase government efficiency, Republicans have been identifying unnecessary laws and government waste. My colleagues Dan Thurlow (R-Grand Junction) and Kevin Priola (R-Brighton) passed legislation out of the House which repeals unnecessary laws, and I am proud to have also passed a bill that will help streamline government. My bill, House Bill 1081, repeals a statutory requirement mandating that the Department of Health Care Policy and Financing create eight redundant reports. These reports are statutorily required, which forces the Department to waste time and taxpayer dollars. House Bill 1081 has passed both the House and Senate and now awaits the Governor's signature. While the repeal of obsolete statutes may not seem like a lot, small victories are the foundation for significant change and can make a real difference in our government. I was pleased to see Representative Thurlow's bill, House Bill 1026, and Representative Priola's bill, House Bill 1130, unanimously pass out of the House. These bills repeal obsolete reporting requirements in the Colorado Departments of Revenue and Education. Both bills now await a vote of the Senate, and given their strong bipartisan support, I expect the Governor to sign them into law. No single bill alone will meet our goal of limiting the size of government. Rather, achieving lean government will happen in steps. Each bill requires an open dialogue between the legislature and state employees, and my Republican colleagues and I will continue to make this a priority. We are more than a third of the way through this session and I look forward to taking on more opportunities to stretch taxpayer dollars and eliminate government inefficiencies. Thank you for taking the time to read our newsletter. If you have thoughts about my bill or other ways we can streamline government, please contact me. You can keep up with all of our caucus updates by following us on Twitter and Instagram, liking us on Facebook or visiting www.coloradohousegop.com. 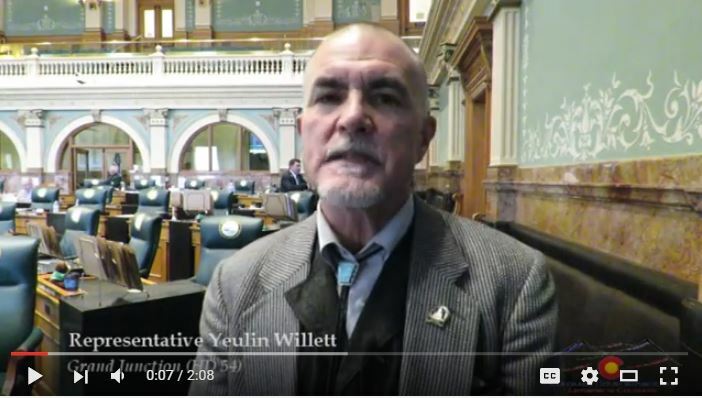 Representative Yeulin Willett (R-Grand Junction) talks about two low-lights from last week - House Bills 1138 and 1181 both being killed on party-line votes - and his bill 1201 addressing the use of companion animals. No opposition to @BrownJPaul bill for transportation & it dies in committee. Great bill to keep $ in transportation. Representative J. Paul Brown (R-Ignacio) presents his bill, House Bill 1138, to the House State, Veterans, and Military Affairs Committee to direct funding to transportation. Even though there was no testimony opposing the bill, Democrats on the committee voted party-line to kill the bill. Representative Jim Wilson (R-Salida) discusses his bill to give counties the ability to designate roads as part of the Pioneer Trail. The bill passed the House and moves on to the Senate. Representatives Lori Saine (R-Firestone) and Dan Nordberg (R-Colorado Springs) in a lighter moment before committee. Rep. Saine's bill to help small business in Colorado passed committee and the House unanimously and moves on to the Senate.